This commanding vantage point seemed an auspicious venue for the launch of a book on the subject of leadership. After a day of sporadic autumnal rain, the evening dried out, allowing guests to enjoy the balcony, beneath a moody sky, and above a city refreshed by rain. Family, friends and colleagues milled about in a relaxed and celebratory atmosphere, toasting to the success of Niamh with champagne, wine and sumptuous canapés. The new book comes hot on the heels of the success of Niamh’s first book, Got Promoted? Get Promoted. (Again). It is a follow-up guide in how to best accelerate leadership performance in the critical first 100 days of a new role. Written in a speed-read style for the time-pressured reader, the book outlines key priorities and strategies for early and lasting success as a leader. 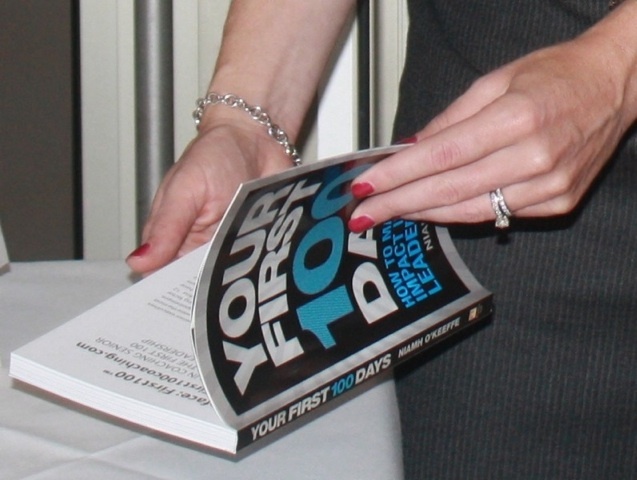 Your First 100 Days: How to Make Maximum Impact in Your New Leadership Role has been selected by WH Smith Travel as their business book of the month for November. It is available now from your local bookseller. After a wonderful evening, I left the launch contented, with one last greedy glance at London, and a copy of Niamh’s book under my arm.